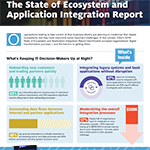 According to the 2019 State of Ecosystem and Application Integration Report, poor integration could be taking a $500,000 toll on your business. ROCKFORD, Ill.--(BUSINESS WIRE)--Businesses in every industry face B2B, application, and cloud integration challenges that jeopardize revenue opportunities and threaten growth, and more than half of organizations report that those challenges take a $500,000 toll on the business every year. Cleo, the global leader in cloud and ecosystem integration technology, recently surveyed 100 IT decision-makers across industries to gauge the state of their integration and digital communication capabilities. The surveyed companies spanned the supply chain, financial services, retail/e-commerce, healthcare, and technology sectors, and nearly 70 percent reported annual revenues between $100 million and $1 billion. The results, which have been compiled in the 2019 State of Ecosystem and Application Integration Report, indicate a costly gap in the strategies and solutions required to support the modern business. While nearly all the survey respondents are aware of the critical role initiatives like IT modernization, system consolidation, and end-to-end visibility play in their ability to compete and drive revenue, they also understand the realities of their current IT infrastructures and processes, and how challenging it is just to keep up – let alone get ahead. The escalating costs directly related to these challenges are significant: Poor integrations and lack of resources contribute to hundreds of lost orders each year, leading to annual revenue losses in the range of $250,000 to $500,000 for 57 percent of those surveyed and upward of $1,000,000 for others. 95 percent of surveyed companies strive to enable their business ecosystems, but 38 percent lack confidence in their capacity to scale to support the integration initiatives foundational to doing so. 63 percent of IT decision-makers say new business onboarding is too complex and takes too long. 29 percent report lacking the skilled resources to build and manage integrations between systems, applications, and partner ecosystems. 22 percent say legacy technologies cause significant delays in generating new revenue, and 81 percent believe replacing legacy systems will support emerging business initiatives. Overall, the decision-makers surveyed said modernization is key to consolidating disparate technologies, automating data transaction processes, and gaining visibility into their critical data flows, and it is the reason why more than half plan to modernize their integration and IT infrastructure in 2019. But such modernization efforts start with the strategic alignment of business units and IT teams working toward the goal of long-term success. That alignment, according to Cleo, will manifest as a modernized digital ecosystem that eliminates the end-to-end data flow interruptions costing organizations hundreds of thousands of dollars in lost revenue every year. Cleo is an ecosystem integration software company focused on business outcomes, ensuring each customer’s potential is realized by delivering solutions that make it easy to discover and create value through the movement and integration of enterprise data. Cleo gives customers a strategic, “outside-in” visibility into the critical end-to-end business flows happening across their ecosystems of partners and customers, marketplaces, and internal cloud and on-premise applications. Cleo empowers teams to drive business agility, accelerate onboarding, facilitate modernization of key business processes, and capture new revenue streams by reimagining and remastering their digital ecosystem through robust application, B2B, and data integration technologies. Cleo’s flagship offering, Cleo Integration Cloud, is a single, hybrid ecosystem integration platform enabling organizations to connect, transform, integrate, orchestrate, and analyze end-to-end application, B2B, and data integrations for improved visibility across your business ecosystems. The platform empowers technical and business personas to make better decisions, create stronger relationships with your trading partners, drive business continuity and accelerate growth as integration requirements change. For more information, visit www.cleo.com or call +1.815.282.7695. According to a 2019 report, integration challenges that jeopardize revenue opportunities and threaten growth are costing up to $500,000 every year.